I am not sure, if you are familiar with the feeling of independence when swimming in a single kayak, or the feeling of stability and comfort of a pedal boat. No matter how well you know these feelings, imagine that you can experience all of them simultaneously. Thanks to the combination of both types of these boats, we have managed to create a product we are now happy to present you with. It is a light and fast pedal boat, as functional as a kayak, and powered with legs which are much more powerful than hands. It is also characterized by a lot of loading space for possible luggage and it enables a comfortable, half-lying position - just like on a horizontal bike. In short, it is a totally new take on a pedal boat. 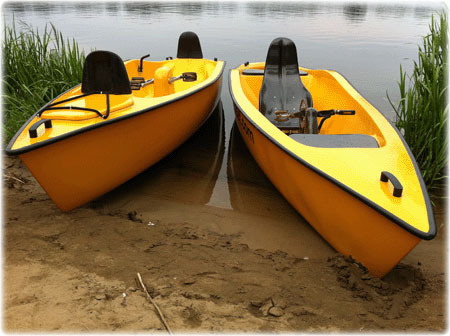 Double pedal boats - NEW!